The following address was given at a panel discussion on immigration on Tuesday, Sept. 1 at the Archdiocesan Pastoral Center in Philadelphia. Watch for full coverage of the event coming soon on CatholicPhilly.com. As you know, Pope Francis will join us for the World Meeting of Families later this month, and immigration is an issue close to his heart. So I’m pleased to be here and to share this time with you. Tonight, I want to talk about immigrant families. Immigration can be a tough issue. At least one of our presidential candidates has already made the national immigration debate ugly with a great deal of belligerent bombast. His success in the polls shows that many people — including many good people — are very uneasy about the direction of our country. And immigration is a topic with obvious economic, national security and legal dimensions. For the Church, immigration is mainly about the human aspects of the issue — in other words, how our policies should protect human dignity. Migration is about human beings. So it has moral implications. Pope Francis has a special sympathy for migrants and refugees worldwide. His first trip as pope was to Lampedusa, an island in the Mediterranean, to remember migrants who died trying to reach Europe by boat. He spoke about a growing “globalization of indifference” that ignores the pain of those seeking to migrate, and that treats migrants as a part of a “throwaway culture.” Francis will likely return to that message when he visits Philadelphia. A key concern for the Church is the impact of immigration policy on families. The social costs of a flawed immigration system are immense. Bad immigration laws undermine families and communities. They do special damage to the most vulnerable, starting with children. The damage happens in the sending countries, when a parent leaves home to support his or her family by finding work elsewhere. And it also happens in receiving nations, where undocumented parents can be deported away from their citizen children. With the Holy Family as her “model and protector of every migrant, alien, and refugee,” the Church is committed to helping migrants with the resources needed for their well-being. The duty and the privilege of that commitment apply to all of us equally. In welcoming migrant families, we need to grasp the global inequities that force the separation of families. Poverty and violence in their home countries force parents to leave their children behind and earn money in foreign lands to support them. Or in some cases, parents send their children away to other countries to protect them from harm. We see this today in Central America, where parents send their children to the United States and other nations to escape the bloodshed of organized criminal networks. But here in the United States and elsewhere, immigration laws often don’t take into account the social costs of separated families. Many nations, including our own, have immigration policies that weaken, rather than strengthen, the family. I’ll give you a few examples. First, we’ve recently experienced a record U.S. deportation rate, with roughly 2.6 million persons deported under the Obama administration. This brutally affects immigrant families — especially those with children who are U.S. citizens. Some 75,000 families with U.S. citizen children are wounded every year by deportation, with one or both parents removed from American soil. Some of these same children have been forced to follow their parents to countries they don’t know. Others have stayed in the United States without their parents. We need to ask ourselves: Do we really want to invest in young U.S. citizens — the future leaders of our nation — by deporting their parents? The answer should be obvious. And this is why the U.S. Catholic bishops supported the administration’s decision to provide relief to immigrant families last November. Second, our nation continues to detain families — young mothers with children — who are fleeing violence in Central America. These families pose no threat to anyone. Detaining them is inhumane. And good alternatives to detention already exist, including community-based case management services that ensure families comply with their legal obligations and also receive the help they need. Third, we need to preserve birthright citizenship. Birthright citizenship ensures that children don’t become stateless or part of a chronic underclass. It’s also a constitutional right. It means that any immigrant family is only a generation away from integrating fully into our nation. Some in public life — notably, but not only, Donald Trump — have called for an end to birthright citizenship. This is a profoundly bad idea. It plays on our worst fears and resentments. And it undermines one of the pillars of the American founding and national identity. Fourth, Congress is now discussing a shift of focus away from family reunification as the centrepiece of our immigration system, and toward a stress on economic migration based on a person’s skills, not family ties. Again, this is a bad idea. The waiting time for the reunification of families already can be as long as 20 years, giving families little hope of legalizing their status. Instead of dismantling the family-based legal immigration system, we need to improve it. First, Congress needs to stop squabbling and pass real immigration reform, including a legalization program that gives undocumented persons an honest, attainable chance at citizenship. Such a program would ensure that families can stay together and become permanent contributors to their communities. It would protect them from separation caused by deportation. And obviously the White House needs to deal with Congress in a spirit of genuine compromise and cooperation — which has not always been the case. Both of our major political parties have brought us to our current gridlock. Second, family reunification must remain a cornerstone of our immigration system. This means that the legal immigration process must expedite the reunification of families and that the refugee program must make family reunification a main goal. Third, our nation should not detain families. The practice is needless and inhumane. The U.S. bishops are encouraged by a recent federal court order ending this practice and urge the Obama administration to comply with it. Fourth, birthright citizenship should be maintained. As I’ve already mentioned, this will prevent the creation of a permanent underclass of persons who are effectively stateless. Fifth and finally, the global community must find a way to address the root causes of migration, so that families can live decently in their home countries. This is much more easily said than done. Current international organizations are limited in what they can do, and often have ideological baggage that can make matters worse. But poverty and conflict in sending countries are problems that inevitably spill across borders and impact developed societies. These problems cannot be solved on a quick fix or ad hoc basis. They need a coordinated response from wealthy nations over the long-term. The bottom line is this: Parents should never feel forced to leave their families behind in order to support them by finding work abroad. And they should never be forced to send their children away because of the threat of violence. I hope these ideas will at least offer some seeds for discussion. I also hope they’ll become part of the discourse surrounding the World Meeting of Families and the visit of Pope Francis later this month. I urge all of you to be vigorous advocates for the migrant family, as modelled and protected by the Holy Family of Nazareth. The U.S. Constitution is the foundation of American life — a life that has been supplemented by early immigrants who brought the cultural influences of Mozart, Da Vinci, et al., as well as the existing culture of the indigenous peoples who lived here long before this land was called America. Our way of life needs to be protected. In matters of immigration, our leaders must properly discern who (and who will not) acclimate properly to American life, to protect and preserve the freedoms accorded in our Constitution. There is nothing in the Catechism of the Catholic Church that speaks of an open-border policy as a requirement. There is a limit to the number of immigrants a nation can absorb. Taxpayer Lives Matter!!! 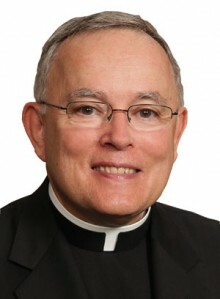 Bishop Chaput’s words about a Catholic response to the issue of the more than 11 million undocumented immigrants now living, raising families, working and contributing to our economy by their work, their hundreds of millions in purchasing is long overdue. Unfortunately, many of our more conservative Catholics still do not accept this clear teaching of our church over the last 50 years. If we are really concerned about the sacredness of human life we Catholics must also subscribe to this strong, consistent teaching of our Church. Pope Frances is asking Catholic parishes in Europe to each adopt at least one immigrant family fleeing from the violence in the Mideast. Many of our immigrant families from Mexico and Central American countries are also fleeing violence and the slow death of poverty in their home countries. Shouldn’t our bishops be asking Catholic parishes to likewise embrace and support our mostly Catholic immigrant families? Jesus hears the cry of the poor. Thank You Bishop for helping me with the immigration issue. I pray daily for the Christians who had to flee their homeland. Voting for Mr. Trump as a Catholic is not a sin. The same people who claim they are against dividing families are the same people who are forcing the Catholic Church to accept Gay Marriage and to be complicit in supporting Contraception and Abortion (Little Sisters of the Poor the last I heard is a Catholic Institution). Stealing Social Security Numbers from others and exposing people to things like TB doesn’t sound Christ like to me. Never heard anything about Joseph and Mary putting other people in harms way like our Border Patrol experiences every day – has the Archbishop gone to any of their funerals? Go to Mass, confession, and receive communion – do you want people like me to stop being Catholic? Archbishop Chaput’s address is welcome indeed and has much to commend it. I also agree with much of what Mr. Schwarwalder said with one notable except.We must not give people who come here legally an advantage over people who do the right thing and follow the law. Perhaps we can find a way to make illegal immigrants acquire legal status but not citizenship. This will help keep the families together in the US but not allow them to “jump the line” and get ahead of people doing it the right way. I am very glad to read the Archbishop’s thoughts on immigration. I was beginning to think that the political campaign for the next President of the U.S. was beginning to silence the Bishops. The global migration matter is complex. After some thought I do not support a different path to citizenship for those in the U.S. illegally versus those who seek to enter the U.S. and become citizens via legal means. That means a way needs to be found to legalize those here illegally short of citizenship. It would help if there was more communication of what the Bishops of Central America are saying regarding their own domestic problems that result in illegal immigration to the U.S. Let’s face it, the problem is world wide, not just between Central America and the U.S. Pope Francis mentions a church “without frontiers”. Unfortunately,many armed conflicts today in the Middle East,the Asian subcontinent and Africa result from national boundaries that do not correspond to ethnic, tribal or language or religious groups. Corruption and drugs are major drivers of what are essentially failed States. So in the U.S. let’s “Welcome the Stranger” to the extent possible understanding that there is no easy fix to a very complex global set of problems. The bottom line is people still vote with their feet when they can.